A 3D printed metal part for a nuclear fusion test reactor. Photo: Dr. Leifeng Liu, University of Birmingham. A new technique for 3D printing metals can achieve exceptional levels of strength and ductility compared with conventional fabrication processes, says a research team from the University of Birmingham in the UK, Stockholm University in Sweden and Zhejiang University in China. 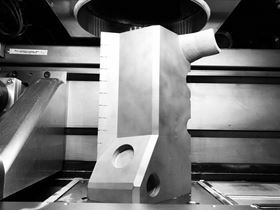 By demonstrating the ability to make strong and ductile metals through 3D printing, this study is crucial for applying the technology to the manufacture of heavy duty metal parts. The researchers describe the novel technique in a paper in Materials Today. Long recognized as a technology that can transform manufacturing, 3D printing is able to rapidly build up objects with complex and customized geometries. With the accelerating development of the technology in recent years, 3D printing, especially metal 3D printing, is quickly progressing toward widespread industrial applications. For example, the manufacturing giant General Electric (GE) is already using metal 3D printing to produce some key components, such as the fuel nozzles for the latest LEAP aircraft engine. The technology helps GE to reduce 900 separate components into just 16, and make fuel nozzles 40% lighter and 60% cheaper. The yearly global revenue from 3D printing is predicted to be over $20 billion by 2025. Despite its bright future, the quality of the products created by metal 3D printing has been called into question. In most metal 3D printing processes, products are directly built up from metal powders, which makes it susceptible to defects, degrading the mechanical properties. "Strength and ductility are natural enemies of one another, most methods developed to strengthen metals consequently reduce ductility," said Leifeng Liu, who is the main researcher on the project and recently moved to the University of Birmingham from Stockholm University. "The 3D printing technique is known to produce objects with previously inaccessible shapes, and our work shows that it also provides the possibility to produce the next generation of structural alloys with significant improvements in both strength and ductility." This has been made possible thanks to an ultrafast cooling rate, estimated to range from 1000°C per second to 100 million °C per second, which was not possible until the emergence of 3D printing. Metals that are cooled down so quickly enter a non-equilibrium state and form some amazing microstructures, like sub-micro-sized dislocation networks, which were revealed in this study to be the main reason of the improved mechanical properties. "This work gives researchers a brand new tool to design new alloy systems with ultra-mechanical properties. It also helps metal 3D printing to gain access into the field where high mechanical properties are required like structural parts in aerospace and automotive industry," said Liu. Synopsis of “The Mechanisms of Ductile Rupture” (Philip J.NoellJay D.CarrollBrad L.Boyce) Acta Mat 2018.